This simple beauty ritual might be responsible for Kim Kardashian’s glow, but it dates back to the days of Marilyn Monroe! Haber Dermatology Aestheticians are always keeping up with the latest trends in treating your skin. 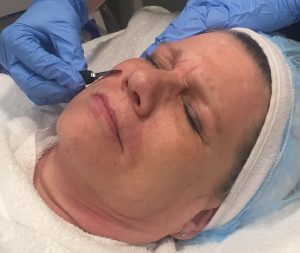 Although it’s been around for years, Dermaplaning has been back in the spotlight recently. Dermaplaning is a non-invasive skin rejuvenation treatment designed to make skin feel smoother and more even toned. Dermaplaning is recommended to treat uneven skin tone, large pores, fine lines, and as a bonus, it even minimizes unwanted facial hair. Contrary to myth, Dermaplaning does NOT cause the hair to grow back thicker and darker. Dermaplaning is a safe, effective treatment for overall skin rejuvenation. It can produce a smoother skin texture while minimizing signs of aging. A surgical blade is carefully stroked over the skin in even motions to painlessly remove dry, dead surface skin and reveal new, healthy skin cells. Patients can resume normal activities immediately following treatment, including applying makeup, although we do recommend avoiding excessive sun and sweating day of treatment. In fact, professional makeup artists prefer dermaplaned skin for a smoother, more natural-looking makeup application, making Dermaplaning the perfect treatment the week before a special occasion such as a wedding, homecoming, prom, etc. At Haber Dermatology, our Aestheticians will begin your Dermaplaning treatment by removing dead surface skin and unwanted facial hair, then a calming mask will be applied to your skin. While you’re relaxing with the mask, you’ll enjoy a hand and arm massage. Some skin conditions may also benefit from adding a Chemical Peel after the Dermaplaning treatment. The Dermaplaning removes the dead surface skin allowing for a deeper penetration of the Chemical Peel. There may be a longer down-time if a Chemical Peel is added to your treatment, so plan accordingly. The best way to determine if Dermaplaning, with or without a Chemical Peel, is right for you is to schedule a complimentary consult with one of our Haber Dermatology Aestheticians.